Differentiation is a buzzword that’s tossed around frequently in education, and most teachers agree that adapting instruction and assessment to meet the varying needs and interests of students is beneficial. However, for a teacher faced with a rigid curriculum, this can be a struggle. Some districts require teachers to give all students across a grade level the same test or quiz, while others purchase a specific curriculum, which can work against differentiation. But there are a variety of ways to infuse differentiation within curriculum constraints. Each unit has a designated set of skills that students are expected to master. Some students struggle with these skills and others glide through with ease. In order to accommodate all learners, I start each unit by pulling apart the required skills. Using a mind map, I list the main goals from the curriculum in the center. Above these goals, I’ll branch out to a list of other skills that students need to have mastered in order to achieve the current curriculum goals. For struggling students, the mind map serves as a point of guidance for the skills they need to master before working toward the curriculum goals—they can see what they need to work on. For example, if a curriculum goal in an argument essay is for students to introduce a claim and refute opposing claims, they first need to be able to generate a claim statement and analyze opinions that others may have on the topic. These supporting skills need to be addressed prior to introducing students to the curriculum goal—otherwise it will be more difficult for them to find success. For the students who can already reach a goal, I consider how they can extend their learning. Extension activities can include additional lessons that bring students to higher level skills, or open-ended activities or projects related to the topic. Once the mind map is created, I have an overview of the curriculum goals, the supporting skills needed to master those goals, and potential areas of extending skills. Next I create a pre-assessment for the entire class. Generally, I try to avoid multiple-choice tests and instead offer engaging alternatives, such as an escape room, in which players work through a series of puzzles to receive keys that allow them to escape from a locked room. My students work through puzzles based on the skills they’ll cover in an upcoming unit, and I observe to note which students are struggling with different skills. The interactivity and collaboration disguise the assessment features to keep students engaged while still giving me information about their need for an upcoming unit. These assessments do not come from the curriculum and can offer insight into how to pair the required lessons with differentiated lessons. Using the pre-assessment information and skills map for the unit, I create mini-lessons for different small groups, which I refer to as “readiness groups” to avoid labeling students by ability—there’s no low or high group, just different groups ready to tackle skills in different ways. Using a differentiation template I’ve developed to break units of study down into separate lessons, I list the topic of a mini-lesson and split it into three small-group lessons—one targeted toward students ready to meet that goal, another for students who need more support in that area, and another for students who are ready to expand on that skill. For example, if I’m working on a narrative unit and the skill of focus is collecting information, students ready for that skill work on an activity focused on that. A group that needs more support may work on an activity that helps them develop descriptive details to add to their story, including sketching elements of the story to create a visual to assist them in adding details as they compose a draft. Students who have already mastered collecting information to add details to a narrative can expand their skills by considering how their story could change if it was told from someone else’s perspective. The key to small-group lessons is to make them flexible and fluid, so students are working with different peers on building and reinforcing the skills they need to master in the unit. The groups should rotate based on the readiness level of the individual students. The easiest way to build a bridge between differentiation and a curriculum is to try to embed opportunities for student choice. Even within the most complex programs, there can be room for students to make a decision with regard to their learning. Choices can range from large decisions, like how students will demonstrate their learning, to smaller tasks, like selecting a partner for collaboration. Even deciding between handwriting an assignment or typing it is a version of a differentiated choice. I include two final assessments at the end of a unit: one that is the same as the rest of the grade and one that allows for student choice. The first is required by the district—all students across the content area and grade level must complete it. Most of the time, it’s a common writing assessment, such as an argument essay or literary analysis. That’s one final assessment grade. But I create a second assessment that is choice-based. Students meet the curriculum requirements but also have a second opportunity to show what they know in a way that makes them feel most confident. A curriculum does not have to be a roadblock. 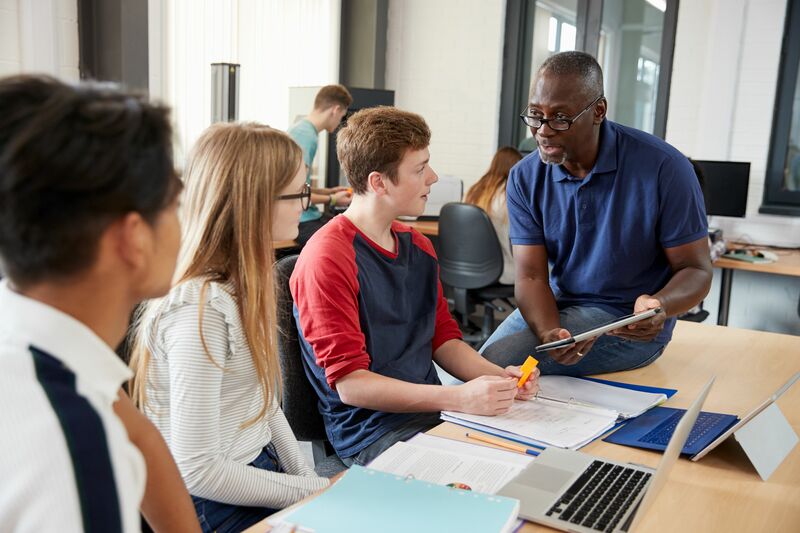 There are plenty of ways that teachers can incorporate individual student needs and interests while still following the required skills and assignments.